I don’t know, how much do you follow food blogs? If you love them, you will surely have seen the beautiful blog Will Cook for Smiles at least once. I’m not telling you this just because you can find great recipes on this blog, but because I have always loved the name of this blog! And I remembered this adorable name after my husband tried this adorable Apple Dumplings for the first time. He was so delighted with the taste that in one moment, he said that he had tried nothing better in his life and kissed me on the cheek. Wooow! And while I still heard the ringing of the kiss in my ears, I thought of a great name for some future food blog – „Will cook for kisses“. Now it was completely clear to me why the photos for this recipes were so popular on my Pinterest boards. 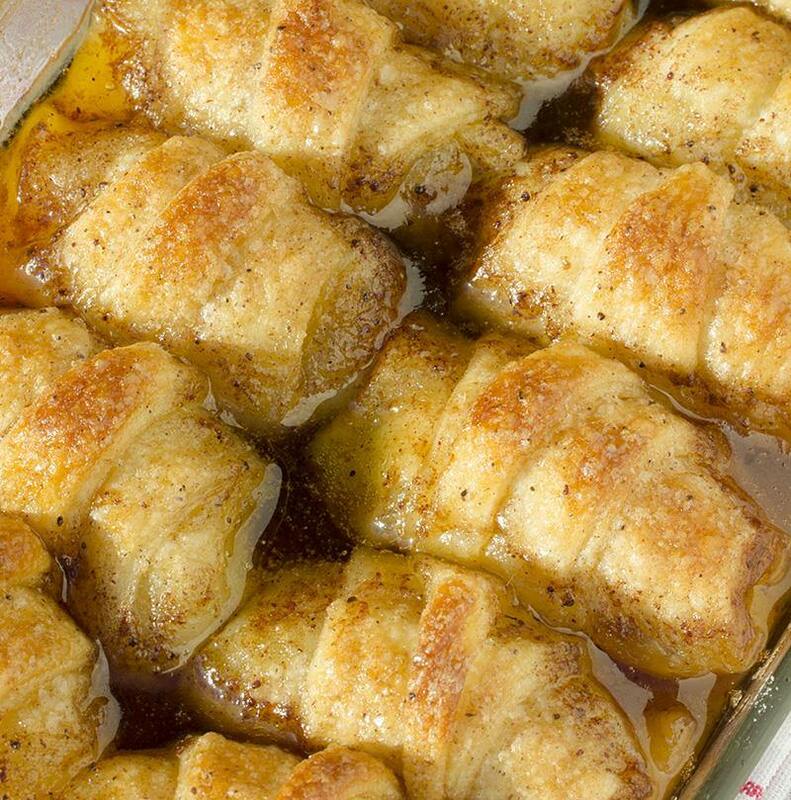 Whenever I would put a photo for Apple dumplings on some of the boards, they would usually have an unbelievable number of shares by my Pinterest friends. „But, what’s up with that?“ I asked myself hundreds of times looking at the photos. The photos were by no means special. Only one bite of this piquant dessert solved all of the mysteries. It was not about the looks, but about the wonderful taste. This is really something so good that I immediately concurred with my husband. „Vera, Apple Dumplings are part of our standard menu from now on“. And since we din’t want to get sick from enjoying the Dumplings, I prepared a plate for „degustation“ for my grandpa. „OMG, could it be possible that I have not tried this yet“ he concluded completely shocked while still on his first bite. „Vera, please, write down the recipe. Grandma will soon have some work to do“ grandpa was chuckling. 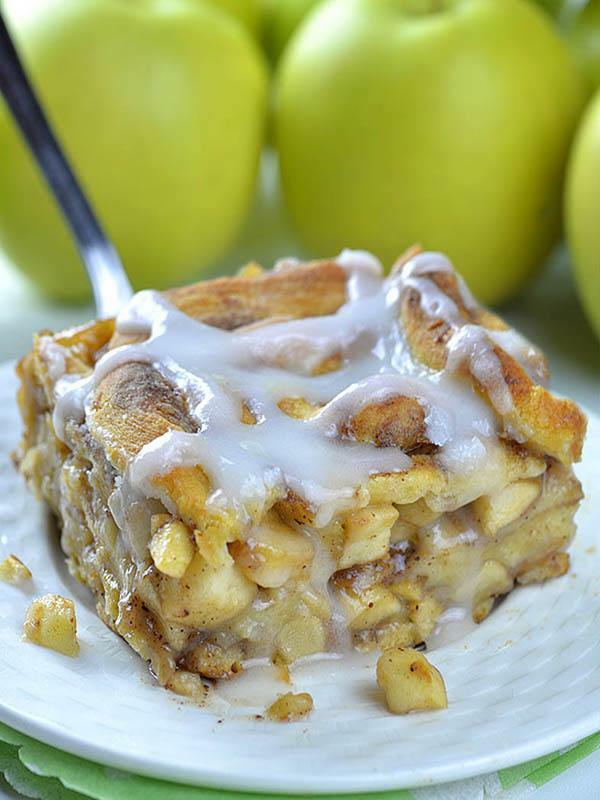 Craving for more apple recipes? Check these!!! Butter a 13 x 9 inch baking dish. 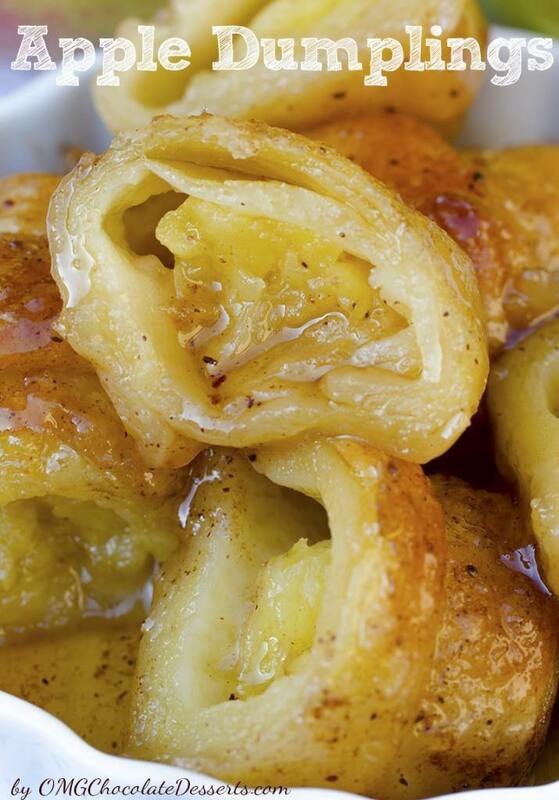 Roll each apple slice in a crescent roll and place in a buttered dish. Melt butter, stir in sugar, vanilla and cinnamon, and when it’s thickened, remove from heat and pour over the dumplings. Bake for 35-45 minutes, or until they become golden brown. I am making this for Easter! I found you on the Strut your stuff link up..and followed you on facebook. I can’t wait to see what else you have in your blog! Thanks for sharing. Hi Ashley, I use Golden Delicious, but you can use Granny Smith as well. Hi Vera! I accidenrly bought sheet dough instead of fees and. Do you think it will be much of a difference in taste and texture? Hi Tirzah, I think it will work just fine! Quick question, so pour the 7up in the same pan as rolls just not directly on top, only around edges and the middle? Have I overlooked how many apples to use? How many apples and what kind? Hi Terry, you’ll need two apples, I use Golden Delicious, but you can use Granny Smith as well. I have used Mountain Dew as well. Still yummy. I make these all the time. I also put into the dough 3 red hot candies (for each one) Serve with ice cream. People groan while they eat it!! Hi Vera, this recipe looks divine. Are crescent rolls the same as croissants ? In SA we don’t have them. Can I substitute with croissants please. My fam love any kind of dumpling. Hi Gail, yes it’s the same. You can use any kind of puff pastry dough, and cut the triangles. We got this recipe from somewhere else …Identical but with peaches and Mountain Dew. Outstanding!!!!!! Gonna try these while camping in my dutch oven. Yummy!! I have tried these and they are delicious and are a hit with the family! I’m trying it with peaches right now. Thanks for the recipe! I have two questions. How would you do this with blueberries? And what is the name of your Facebook page? Thanks! Hi Kathy, I’ve never tried this with blueberries but it sound like an interesting idea. These were great, I added a little more cinnamon. Very easy to make, I will make these again! Might add some chocolate, you can add all sorts of things like carmel too! Hi Fitzy, I think it will work, too. My step mom always makes these with orange juice instead of soda. So very good and rich! I have made these they are So Yummy!!!! Isn’t a cup (2 sticks) of butter a little too much? I made it that way but you could use less butter if you wish. I use a 1/4 th of apple per dumpling and before baking sprinkled red hots on top. Yum Yum I also cut recipe in 1/2 and baked in 8 inch square pan. I have a lot of frozen apples that I need to use. I’m getting tired of applesauce. Do you think I can use these frozen apples in your recipe? truly melts in your mouth ….so good with ice cream n easy to make Thank you! Just made this, it was great. It is just the two of us so I cut the recipe in half. I will definitely make this again. I was disappointed. I thought they were incredibly salty. I ended up throwing them out. Maybe I should have used unsalted butter? Diane, I have made these for years with apples and peaches. Also you can do blueberries with rolled out canned biscuits and fold them over and crimp. They should not taste salty. I’ve never heard anyone say they were salty. Usually when baking you use unsalted butter unless the recipe calls for salted butter. I hope you tried them again with unsalted butter. Mine were delicious. I followed the recipe to the “T” (first time ever lol) and OMG!! Every single person who tasted this, rolled their eyes to the back of their heads! WOW -was this deliciouss!!!! Thanks so much for sharing!!!! These sound wonderful! If I assemble them at night to make for breakfast, I’m concerned that they might get soggy. Do you have any experience with this? I’m sorry Toni, I don’t have experience with it, but i think that’s not a good idea. Can i use ginger ale? Hi Stephanie, you can use it if you like it of course. Can I use orange juice instead of 7up and if so how much. Hi Joyce, some people comented that they used organic orange juice instead of 7up and they were delighted so you could try it too. Thanks for sharing this recipe. And image is so cool. If you looking for a Rolled Dumplings recipe then please visit our site. And you did a great job | keep on posting . These treats look delicious, i def want to try for thanksgiving. I have a question, when they are done, is the dough soggy or crispy? Thanks in advance!! Hi Roxy, the dough is soggy because they are more cooked than baked, only the tops are little crispy.You can reduce the amount of butter, sugar and soda if you want. Can you use lemonade with this recipe! I don’t keep soda In the house! Hi Leah, I haven’t tried with lemonade, so I can’t help you about that. I can’t wait to try these! 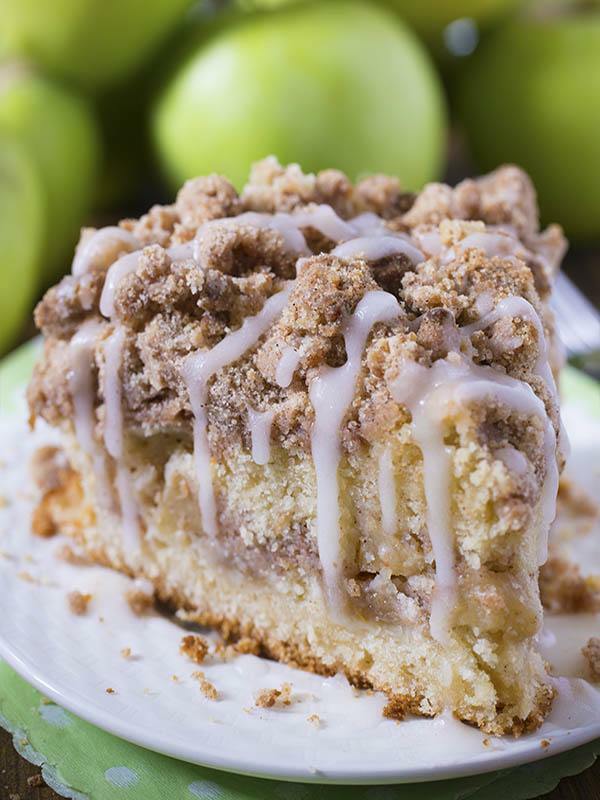 I LOVE apple pie and these look like a wonderful alternate treat!! Thanks for sharing!!! Thank you for the nice recipe. I added into my website with Japanese translation! hi if crescent rolls are not available whats the alternative. Some dough from scratch? Hi Haifa, use puff pasty if you can find or look for the recipe on the internet. Can I make this with just a can of apple pie filling? Adding cinnamon, butter, etc.? Hi Mickey, I think you could but it might turns out too sweet. can u use sprite zero and splenda? You can use sprite zero but I don’t have any experience with splenda so I can’t say. Okay I tweeked this a little, I was in a BIG hurry before hubby left for work on a Saturday. 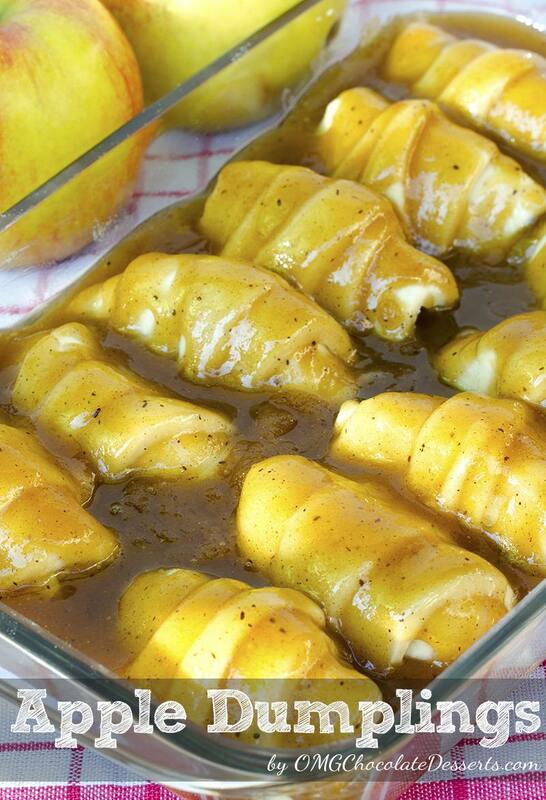 I guess I could call it EasiER Apple Dumplings. I used 2 cans of apple pie filling. Warmed one in a saucepan on top of stove, added tsp. cinnamon, 1/2 cup brown sugar, pulled out 2 pcs. of apple, from the other can, put them in the center of ea. triangle & rolled. Dabbed butter on the top after spreading the warm mixture over the top. Placed in 350 oven for 45 min. till bubbling, & tops of rolls were brown. Next time, will have more time & make your recipe. i found your wonderful receipt over Pinterest and it looks so delicious that i want to try it. But i have one problem, i am from Germany and have no idea where i can find these crescent rolls. What kind of dough are they made of, something like puff pastry? Hi Andrea, yes you can use puff pastry for this recipe. I make these all the time, have also made them with neutella and dioed strawberries, fresh peaches, you get the idea. When I have time I do make my own crescent dough. BIG difference from the canned ones and realy not hard to make. Just and isea. I’ve made these several times but use Mountain Dew or Sun Drop. And I don’t skip on butter or sugar. Such a great recipe and always a hit wherever it’s served! I love reading recipes and trying many of them. I just don’t understand people that try to change ingredients before they have even tried it the way it was printed. And why complain about the recipe if you didn’t like it…just go post your recipe someplace else and don’t comment on the original recipe. This Apple dumpling recipe sounds delicious and I look forward to trying it… exactly the way you listed it! I in giving it 5 stars just because it sounds awesome! Thank you for posting your recipes! Thanks Sandra 🙂 Let me know how do you like them if you try the recipe. i agree Sandra. If you need to change a recipe for dietary reasons I understand the questions about substitutions but why read a recipe and immediately try to change it! If you think you can make it better go right ahead and do it and post it on Pinterest or your own page. I think it’s insulting to sort of say “I can make it better”. I’m making this today just the way it’s printed because it sounds yummy just the way it is! My boyfriend and I absolutely love these. They are such a Great Treat! and they are so easy to make. Now if we can only figure out how to eat just one and not the whole pan. This is the recipe I always use. I like the brown sugar instead of granulated because its not grainy. I also use Mountain Dew. Has anyone used diet 7-UP with this recipe? Being a diabetic, I like to cut sugar when possible so I can have at least a small portion of dessert. Is there a way you can make these ahead of time and bake later (Like freeze them)? I would love to be able to prep it all out the night before and put it in the oven while I’m getting ready for work/getting kids ready for school. YUM!!!!!! I am going to make these this weekend! I made this yesterday and it was so good! I used half of the recipe so we could have 8 instead of 16. We put it on top of vanilla ice cream and yummmm! could apple juice be used instead of 7 up? Hi Marie, I haven’t tried that way, sorry. I would like to make this for tomorrow’s dessert. Would it work if I make it tonight, put it in the refrigerator then heat it up before dinner tomorrow? Thank you for your answer. Hi Ginger, I think that would work. I first noticed these on Facebook, but when I decided to make them used this Pinterest recipe. Halved everything for one can of 8 Crescent rolls. Tasted great but seemed to have a lot of excess butter in the bOttoman of the glass baking dish. So I hunted down the FB recipe and it called for 1cup butter per 16 Crescent rolls which is half as much as this recipe. It also called for white sugar. Next time I will try this with half as much butter and white sugar. Maybe a metal baking pan, too. Why is the sodd used? What could be used in its place? Hey, this is 2016, where’s the video!? I don’t really like the crescent roll stuff, wonder how Pizza or Cookie dough would work? Looks Delish though, lot easier than the way my moms makes them. Too much sugar and white flour,not healthy . It’s a DESSERT…. not many DESSERTS are “healthy… Don’t make it if it doesn’t suit your lifestyle or diet.. I just don’t understand people that make these kind of comments on recipes that are meant to be an indulgence… Not a” way of life”… Simply, don’t make it and go to the next recipe that suits ur own personal preference. I made these using fresh squeezed orange juice instead of the 7 up (didn’t have any) and they were amazing! Everyone went nuts for them! Do you think you can do the same recipe with peaches since they are in season now? I made this tonight & it’s the best dessert I have ever made.I used granny smith apples & I didn’t have 7-up so I used cream soda & it was fabulous!! We put it over butter pecan ice cream & it was a hit!!! Thanks Kathy, I’m so happy about that. I’m nervous about the dough being to gooey. Has anyone had the too gooey and undercooked? Hi Sheena,it’s 1 cup of butter or 225 grams. This recipe seemed a little strange to me. I used a half a stick less of butter and a half a cup less sugar and they still tasted good but the butter and sugar wouldn’t mix together right. The butter came out of the saucepan before the sugar did and I had to use a basting brush to get the sauce all over the dumplings. Then when I pouredn the soda in the pan it was kind of gross because it made the butter float on top like grease. This is a Pioneer Woman original recipe right out of her cookbook. 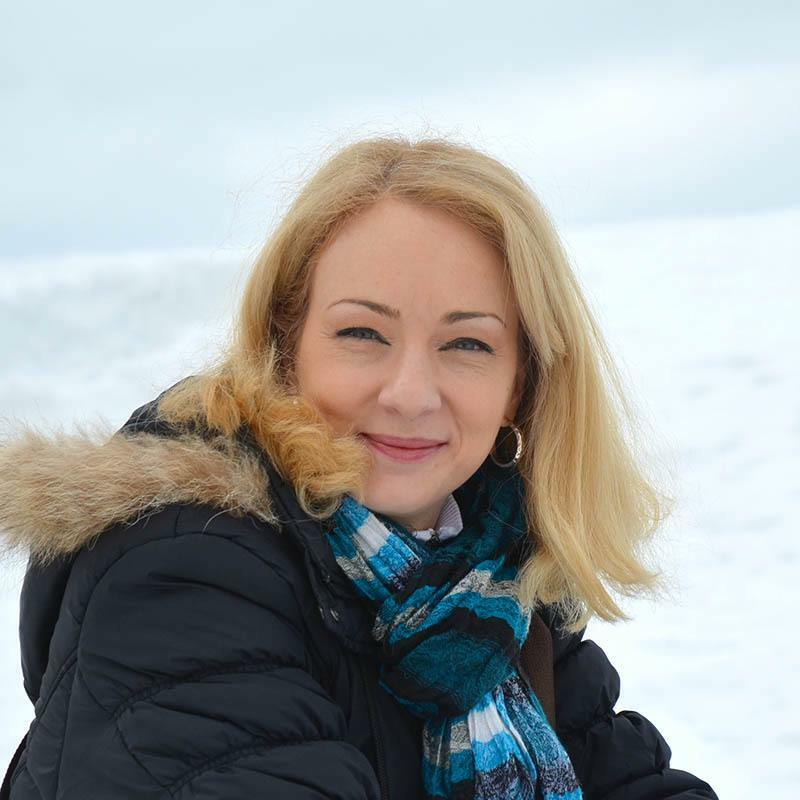 Hi Carolyn, I hope you’ll like it. Happy baking! Could you use just a lemon flavored sparkling water with no sugar in place of the sprite? Hi Debby, you could do that 🙂 Happy baking! So easy and sooooo good. I drizzeled caramel sause over after they cooled…YUM! Hi- Getting ready to make this for a get-together. Can I make these the night before, wait until I’m going to bake them the next afternoon to add the 7-up? Would this still get the same taste??? These sound delicious! I want to make them right away! Do you use salted or unsalted butter? HI Lori,I used unsalted butter. Happy baking! I don’t usually comment on anything. But seriously this is the most bestessssss dessert I’ve made!!! Did exactly what the recipe called for. Mmm mm mmmm!!! For diabetics I used artificial sweetner and diet soda. They were wonderful and the non-diabetics enjoyed them too without missing the sugar. Can I cook this and reheat it the day befoe my guest come, to save time?? Or, should I wait until the day I am going to serve it?? Hi Tina, I haven’t tried o reheat it, but I think it could work.